Is your playroom “just” a playroom? Let Woodland Creek’s help you pump up the rustic decor fun! Oh, the games they’ll play and the fun they’ll have! Woodland Creek’s log furniture and reclaimed wood furniture for the playroom is hard wearing, handcrafted and heirloom quality … for generations full of fine rustic furniture memories. Browse our playroom furniture and pump up the fun factor with kids’ rocking chairs, child’s log tables, Aspen Mountain Kids’ Table Sets and lots more. Pint-sized nature lovers have unique needs. 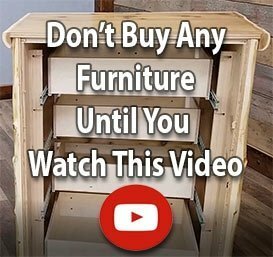 So, when it comes to buying kids’ rustic barnwood furniture tables and child’s wood furniture coat trees, scale down your expectations – but don’t pass on quality! We offer more country decor furnishings for children’s playrooms than anyone else we know, with fine cabin decor touches in specially sized options made to suit little tykes! Outfit their play space with stuff that’ll make ‘em comfy: Footstools, rocking chairs, etc.! When you peruse rustic decorating options suited to children’s cottage furniture or country furniture play spaces, remember to leave room for a little (or big) touch o’comfort. Woodland Creek’s animal themed plush footstools, child’s log rocking chairs, perfectly sized child’s chairs, Spanish Rustic kids’ tables and other accessories make watching TV, playing games and coloring ultra comfy!